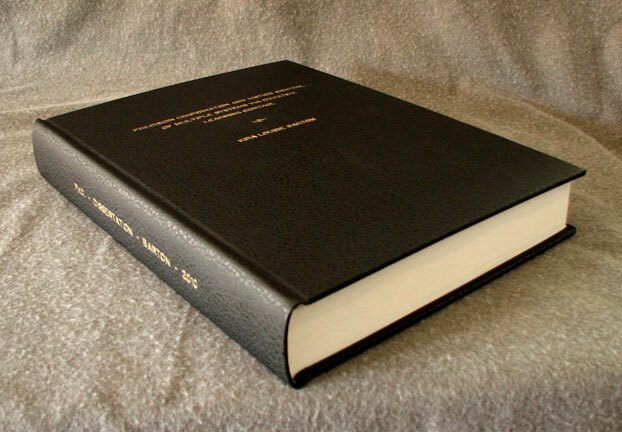 THESIS & DISSERTATION BINDING, HARDCOVER FAMILY HISTORIES, MEMOIRS, POETRY, SMALL EDITIONS, PERIODICALS, ETC. Before sending us your printed pages, or having our local printer deliver them to us, we need your contact informaiton. Please include your email, phone number, and address (if we need to ship the finished books). We will respond with more questions about the details of your order. Your pages will be sewn, cloth-reinforced endpapers are added, and the spine is reinforced with backing cloth. A hardcover is crafted to fit your "book block" (the sewn pages) and is covered with a cloth or imitation leather material in your choice of colors (we have roughly 45 colors of cloth materials available). If you drop your pages off in person, you can see samples of all of our cover materials. The cover is stamped with foil lettering. The front cover might include the title and the author's name. 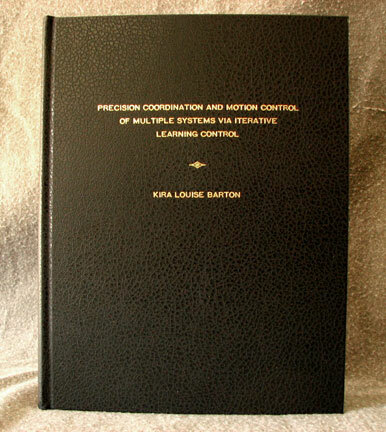 The spine often includes the author's name, the degree, and the year. Some institutions and some advisers have specific format requests for cover type. You tell us what lettering you want on the cover and where. Lettering can be added to the cover in one of several foil (metallic) or non-foil (non-metallic) colors. Please click on "Information on printing your pages" to read some guidelines for the printing and layout as well as to see contact information for a local printer who can accept pdf files electronically. If you plan to place an order long-distance, please contact us by e-mail. Ultimately, we will need to receive your pages, your contact information, and instructions on how you want the book to look (cover color, color of the lettering on the cover, etc.). Remember, the price per book is less if you have multiple copies of the same book bound at the same time. So if you are considering having multiple copies bound, you will save money if you do them all at once. 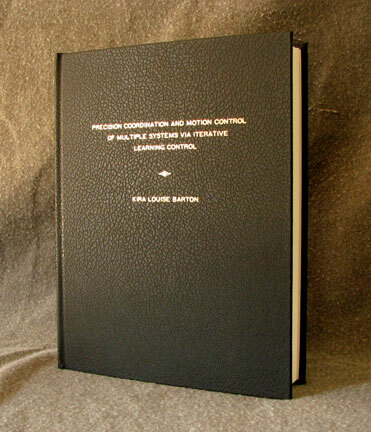 Turnaround time on thesis and dissertations orders is typically 7 - 10 days from the day we receive your printed pages. Copyright 2011 Lincoln Bookbindery. All rights reserved. Web Hosting by Yahoo!